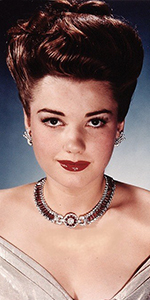 Anne Baxter rose to prominence at 20th Century-Fox, where she co-starred with Bette Davis in the immortal film All About Eve, then continued on in films and television. Yes, Anne Baxter is related to architect Frank Lloyd Wright. Her mother, Catherine, was Wright's eldest daughter with his first wife, also named Catherine. Anne's mother married Kenneth Stuart Baxter, and they lived in Michigan City, Indiana. Having appeared in a school play at age five, Anne continued performing when the family moved to Westchester County, New York, when her father got promoted at the house of Seagrams in Manhattan. She attended the girl's private school Brearly in the city. Taken to see a Broadway play with Helen Hayes at the age of ten changed Anne's life; she declared to her family that acting was to be her profession. Baxter has always seemed like a determined person. She made her Broadway debut at age 13 in Seen But Not Heard, in 1936. She tried out to play Katherine Hepburn's young sister in The Philadelphia Story in 1939 (Vera Allen got the part). Turning to Hollywood, Baxter auditioned for the lead in Rebecca (released in April, 1940), but Joan Fontaine got the part. Somehow, she got a contract with 20th Century-Fox, initially loaned out to M-G-M for the Wallace Berry western 20 Mule Team (which played the Chinese in May, 1940). Baxter was selected to play in Orson Welles' The Magnificent Ambersons (released in July, 1942), and did a very credible French accent in Billy Wilder's Five Graves to Cairo (released in July, 1943). Baxter hit the Hollywood bigtime with her turn in The Razor's Edge (which played the Chinese in December, 1946), winning the best supporting actress Oscar. 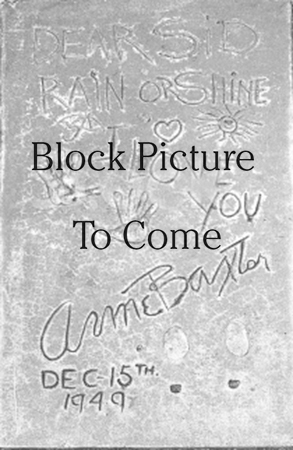 She starred with Gregory Peck in the western Yellow Sky (played the Chinese in January, 1949); that December, she and Peck did their Forecourt impressions on a rainy night, occasioning Baxter to make her "rain or shine" inscription. Then came the role Anne Baxter will always be remembered for: as Eve Harrington in All About Eve (which had its West Coast premiere at the Chinese in November, 1950, and opened later that month). Baxter claims she patterned her character on a child actress who threatened to "finish her off" while she was in Seen But Not Heard. All About Eve, with Bette Davis is an essential viewing experience. Baxter signed a two-picture deal at Warner Bros., making I Confess (released in February, 1953, and The Blue Gardenia (released in March, 1953). Then she got to play the seductive Nefertiri in DeMille's remake of The Ten Commendments (released in October, 1956). After that, Baxter did a film now and again, such as the remake of Cimarron (released in December, 1960), A Walk on the Wild Side (released in February, 1962), The Busy Body (released in March, 1967); she played a central role in the film Fool's Parade (released in August, 1971), and Jane Austin in Manhattan (released in July, 1980). But Baxter's bread and butter was her work on television. Beginning with the Schlitz Playhouse in 1957, she guest starred on almost every show popular at the time. She was on Wagon Train (1959), The Alfred Hitcock Hour (1963), My Three Sons (1967), and appeared as Zelda the Great and Olga, Queen of the Cossacks on Batman in 1967. There's more: The F.B.I. (1968), Ironside (1969), The Big Valley (1969), Bracken's World (1970), The Name of the Game (1970), Marcus Welby, M.D. (1973), Columbo (1973), Cannon (1973), and guested a lot on her friend's The Mike Douglas Show, and starred in the telvision series Hotel, taking over for an ill Bette Davis in 1986. She replaced Lauren Bacall as Margo Channing in the Broadway musical staging of All About Eve — Applause — on Broadway in 1971-1972, and starred in the omnibus show Noël Coward in Two Keys on Broadway in 1974. She published a memoir, Intermission: A True Tale, recounting her marriage to cattle rancher Randolph Galt, in 1976. While hailing a cab in Manhattan, Baxter suffered a brain aneurysm, and was on life support for eight days until her family concluded that brian function had stopped. She died on December 12, 1985, at the age of 62. Grauman's Chinese Theatre, Hollywood, California. Gregory Peck / Anne Baxter Forecourt ceremony, Thursday, December 15, 1949. 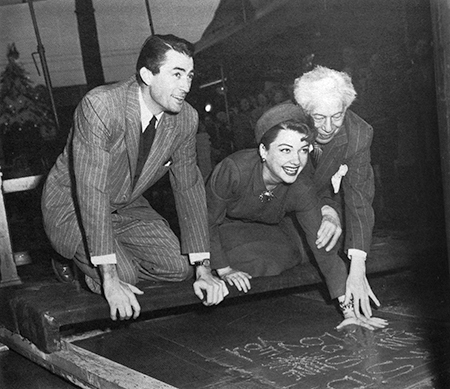 Ladies first, as Gregory Peck looks on while Anne Baxter places her handprint in the cement with Sid Grauman's help.